Are you looking for natural bee products for a healthy diet, your hair, skin and products for your body care products? They are always optimally suited for your body and soul. Bee's products There are 29 products. 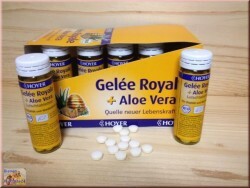 60 pieces chewing tablets.Food supplement means with Gelée Royale, aloe Vera and vitamin C. For vitality and well-being. Quality control (Checked through independent sworn in competent laboratory Dr. Curtze). 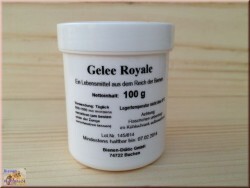 Royal jelly is a unique biological natural product of bees. Apivitalroyale Plus Royal Jelly, these high-quality aperitif with five valuable ingredients mainly from the hive + wheat germ extract, elderberry concentrate and lecithin is a taste sensation unlike any other. 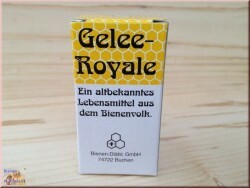 Lip balm with propolis, beeswax and honey. 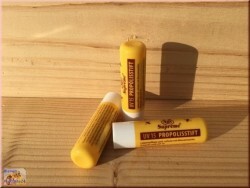 Excellent lip protection by beeswax, propolis, honey, provitamin B5, lanolin and vegetable oils. Propolis and Echinacea and sage ensure a healthy oral flora. Pure, natural flavors donate fresh breath. Skin Balm with propolis, beeswax and honey. 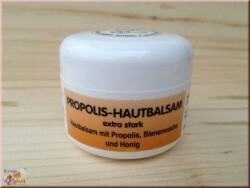 Propolis Skin Balm contains a high concentration of propolis, a natural antibiotic of bees. Propolis night cream for dry skin, for extremely dry skin, this cream is recommended as a day cream.A skin-specific vitamin complex of A and E, propolis extract and a special moisture factor pamper and nourish your skin gently.